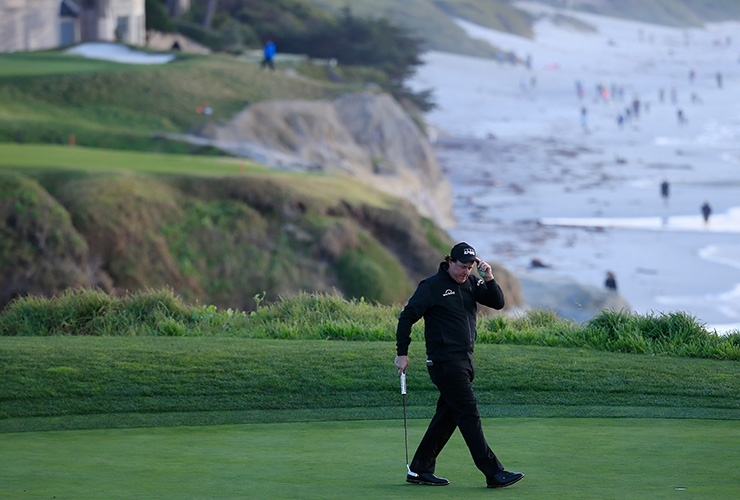 Phil Mickelson reacts to his birdie on the 9th green during the final round of the AT&T Pebble Beach Pro-Am at Pebble Beach Golf Links on February 10, 2019, in Pebble Beach, California. There is good news and bad news for Phil Mickelson. The good? He currently leads Paul Casey by three at the AT&T Pebble Beach Pro-Am with just two holes remaining. The bad? They have to finish up on Monday morning (late Monday UAE time), a fact Mickelson was none too pleased with as PGA Tour rules official Mark Russell explained the situation to him on the 16th green. It’s understandable, considering Mickelson was playing some superb golf. After a hail storm had final round delayed play, the skies cleared and Lefty put on a show. He made birdies at the par-5 second and the par-4 fourth, then made back-to-back birdies on No.’s 9 and 10, arguably the most difficult two holes on the course. At 13 he hit a low, cutting wedge to seven feet for another birdie, and he followed that up with another birdie at 14, which was set up by another deft wedge shot into the green. Before it got too dark, he made pars at 15 and 16, and lobbied to continue playing despite the lack of vision. “I can see fine,” Mickelson could be heard saying on the CBS broadcast. But all it takes is one of the players in the group to call it off, and Casey did, marking his par putt on the 16th green and saving it for the morning. “I don’t have 20-80 vision, I barely have 20-20,” said Casey afterwards. For Casey, it was the right move, not only because the sun had already set but because Casey had been struggling up to that point, sitting at one over for the day. Stopping play also meant fresh greens for the morning, which will be a welcome sight after the soft putting surfaces at Pebble got beat up by all the play on Sunday. There was no chance they were going to finish anyway, so Casey knew he made the right call. Mickelson, who was visibly angry with the decision on the broadcast, was much more understanding in his comments after, though it was still clear how badly he wanted to win for a fifth career time at Pebble Beach as soon as possible. Casey and Mickelson, and Casey’s amateur partner, will be the only three back on the course at 8 a.m. local time, 11 a.m. ET. The rest of the field was able to finish, including Scott Stallings, who carded a six-under 66, which currently has him tied for second with Casey at 15-under 272. Jason Day and Si Woo Kim are tied for fourth at 13-under 274.